I believe I can peacefully pass into the Great Beyond now having experienced the wondrous vision of Charlize Theron in a skintight couture lace gown and a deathly sharp-looking crown on her perfect head, flopping around on a floor like a fish out of water. It was like a scene from a John Waters film. It felt oddly cathartic to watch the actress so known for her utter loveliness go full-out, scene-chomping campy in her role as the evil queen in Snow White and the Huntsman. In another time, in a land far away and full of magic, a lovely young queen’s sudden death devastates her loving husband and adored little daughter. The King nobly soldiers on, protecting his kingdom and saving the weak. This is how he meets Ravenna; a woman imprisoned by a phantom army until it is destroyed by the King’s forces and she is freed. He instantly falls for the mystery lady’s stunning beauty and marries her immediately, without pausing to find out a single thing about his new bride, like the important detail that she’s a murderous, man-hating, psychopathic witch. So, there goes the King - on his wedding night, yet - and Ravenna assumes the Crown, grinding the once happy and prosperous realm into a filthy, impoverished ghost town. Taking care of small details, she also remembers to lock up the Princess, Snow White, and keep her out of sight for years. Ravenna’s good looks, of which she is immensely proud, aren’t just the stuff of good genes and early bedtimes; being a practiced sorceress, she can drain the youth out of the kingdom’s female populace, which comes in handy as her magic takes a heavy physical toll. Under her rule, all is dreadful for the queendom, but pretty good for Ravenna and her creepy brother, until a conference with the witch’s magic mirror spells the end for Snow White. The spectre from the mirror reveals that Ravenna can keep her looks and magic intact forever if she consumes the heart of the one who has finally grown up to become the fairest in the land; good ol’ Snow up in the tower. Thanks to the bro’s lechery and the kindness of birdies, Snow White makes a break for it and escapes into the Dark Forest; a land so filled with scariness that only one unfortunate man can wade through it. 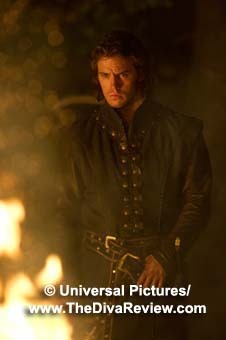 Promising to use her powers to restore his dead wife to him, Ravenna hires a drunken, dissolute huntsman to find Snow White. 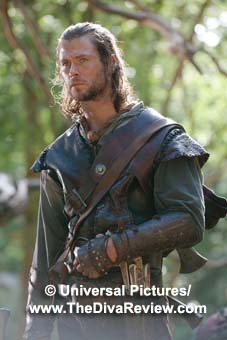 Paralysed by poisonous bogs and having no particular direction, Snow isn’t hard to find, but the Huntsman trusts the frightened young girl more than Ravenna and her icky sibling, and not only lets Snow go, but helps her escape, having no clue that she is the Princess and rightful heir to the throne. Pursued by Ravenna’s forces, the pair makes friends and loses them as the Queen’s men annihilate everyone and everything in their path. It’s only when they cross paths with some very small, ornery men that don’t take kindly to strangers in their neck of the woods, that they find a place to rest and plan before heading to one of the King’s vassals who might help the Princess take back the throne. The dwarves have also suffered because of the evil Queen’s reign, having lived good, respectable lives while Snow’s dad ruled. They’re quickly talked into joining the fight against Ravenna and so starts the revolution and the battle between the two beauties for the Queendom. 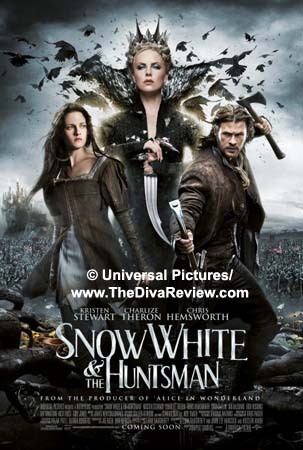 Played fairly straight and more adult and action-packed than other retellings, Snow White and the Huntsman is good fun. The casting is one of its highlights; with Charlize Theron born to play the evil Queen. I have no idea how she remained so amazingly thin after chewing every inch of film she appears in as the over-the-top, nutball witch. Theron is unafraid to play it campy, but does so without winking at the audience. If anything, she seems very comfortable with the film’s sardonic tone about the value and power of physical beauty. Both Snow White’s and Ravenna’s mothers embraced their daughters’ good looks, but unlike Snow White’s, Ravenna’s mom didn’t have time to teach her child about the term “pretty on the inside”. Thor’s Chris Hemsworth is perfectly cast as Snow White’s hunky saviour. 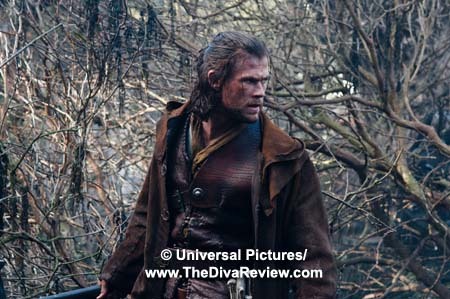 The Huntsman is in a tailspin after the death of his wife and the last thing he needed was a damsel in distress, but there she was. Besides looking the part, Hemsworth has quite good comic timing, which is fortunate as much of the movie’s humour comes from his character’s befuddlement at a series of unexpected, life-threatening situations and the arrival of the angry dwarves. Very unsettling is the effect that made tiny men out of some of the UK’s greatest full-sized male actors: Seeing the handsome lion’s head and matching roar of Ian McShane attached to a diminutive body, running around doing feats of derring-do is downright bizarre, but director Rupert Sanders is wise enough to focus on medium or close-up shots, so the audience isn’t too distracted by the CGI freakiness. (Speaking of freakiness, there’s also the non-CGI creepiness of Ravenna’s icky albino brother.) The dwarves kick the film up a notch and it’s mostly due to the infusion of humour and heart brought by McShane, Bob Hoskins, Ray Winstone, Eddie Marsan, Nick Frost and Brendan’s boy, Brian Gleeson. 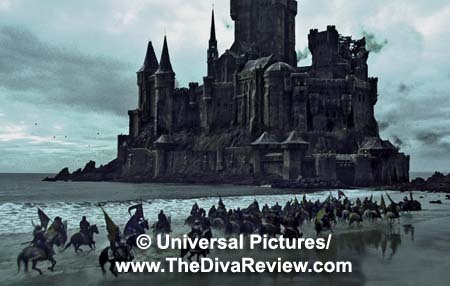 The dwarves get full-on battle scenes against the Queen’s soldiers that would make Yoda proud. 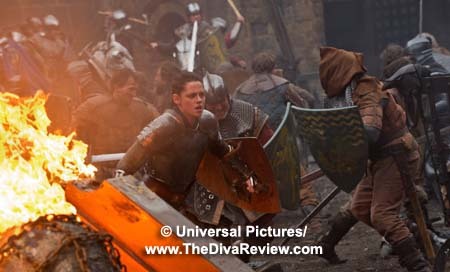 Full of spunky girl power is our heroine, Snow White, played by Kristen Stewart. Strangely, except for a lot of being rescued and eventually leading loyal followers into battle, there isn’t a whole lot of development with this version of the character; she’s kind of just there. Unlike a lot of folks, I’m not prejudiced against Stewart because she plays the vacuous Bella Swan in the Twilight films (I thought she was great as Joan Jett in The Runaways), but I was a little let down here. While I hadn’t expected her to devour scenery like Charlize Theron, I would have liked her to register more than one and a half facial expressions. During the lead-up to the big climactic battle, I was unconvinced that men who’d never met Snow White would follow her to their deaths based on what was I’m sure meant to be a stirring Braveheart-like speech that Stewart delivered as if she herself didn’t believe a word of what she was saying. There is the unavoidable inclusion of a Twilight-esque love triangle between Snow White, the Huntsman, and Snow’s rediscovered childhood friend. Despite the old pal being very cute and having some cool, Legolas-on-steroids archery scenes, it’s obviously Team Huntsman all the way. When the inevitable showdown between Snow White and Ravenna does arrive, like that scene I mentioned with Theron in the skintight haute couture, it’s a flop, but in a bad way. It doesn’t make much sense and I can’t tell if it was rushed or just badly written, but it leaves the audience with a bad taste after the rest of the film had been pretty darn entertaining. This telling of the classic bedtime story is far more Grimm fairy tale than the children’s fluff of this year’s earlier Snow White movie, the lovely but misfired Mirror Mirror. 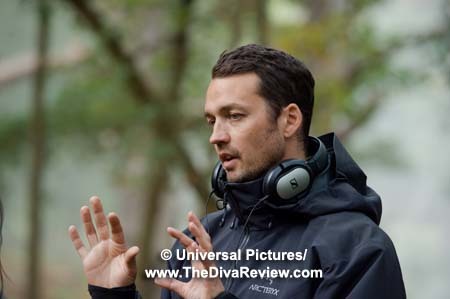 Both films feature lush visuals, but Snow White and the Huntsman’s production has darker, more Gothic leanings than the bright, technicolour fantasy of director Tarsem Singh’s take. 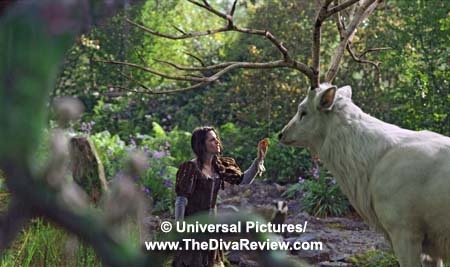 There are some storybook-pretty scenes like the good guys’ escape from the Dark Forest into a land of Fae that has awaited the virtuous Snow White’s arrival, including a really cool homage to Hayao Miyazaki’s classic Princess Mononoke by way of a forest spirit represented by a gorgeous stag with humungous antlers. Wonderland moments and weird CGI midgetry aside, the most stunning visual might be Charlize Theron herself in full flower as the Fairest in the Land - for the time being - who learned at a tragically early age that her looks were her fortune. 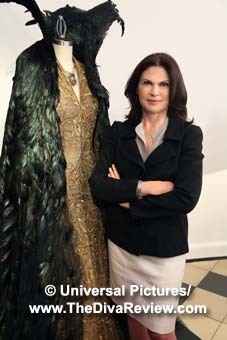 The Queen’s gorgeous costumes are made of the expected brocades, satins and laces, but her jewelry, particularly her sharp, deadly crowns and lethal, pointed nail guards seem to be custom-made by Chrome Hearts, purveyor of high-end accessories favoured by wealthy bikers and Asian rock stars. Her black, feathered gowns with high collars and plunging necklines are more like a second skin, especially when the witch shape-shifts into a murder of crows that emanate from her dress and spills back onto her like ink as her power wanes. There are lots of dreamlike and creepily surreal images all through the film. The movie’s neat visuals, combined with its more serious, thrilling tone made me sorry that this wasn’t the film Tarsem chose to direct. Even without the artistic filmmaker’s vision, this Snow White pulls off its combination of a great-looking production and good performances with a nice balance of action. 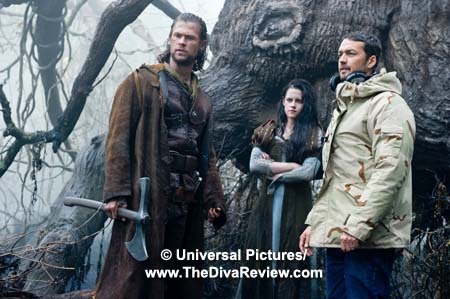 But for a few drawbacks, Snow White and the Huntsman is an entertaining and exciting spin on the classic tale.